Situated in the heart of a beautiful rural village at the foot of the South Downs National Park in West Sussex, the Lodge offers excellent spacious self catering accommodation for two people with several lovely pubs, cafes shops, restaurants and a small local theatre in less than 5 minute walking distance. It has been built and furnished to a high standard offering quiet comfort and a relaxing atmosphere. The design of The Lodge is light, sunny and spaciously open plan. The atmosphere is both relaxing and serene with secluded accommodation, decorated and furnished to a high standard using muted colours and French antiques together with modern luxury. The kitchen is very spacious and well appointed. There is a good size bathroom with a large walk in shower and heated towel rail. The bedroom area has a Super King bed with Egyptian cotton bed linen, fluffy towels, cosy dressing robes. The kitchen is spaciously designed and fully equipped with ample worktops, a breakfast bar with stools under, a Fan assisted oven, electric hob, microwave oven, dishwasher, washing machine and a fridge with an icebox. Retired property developer. Enjoys socialising, occasional sailing trips on friends boats/yachts. Motor sport, Travelling/touring especially England. It is situated in the heart of a beautiful rural village at the foot of the South Downs National Park in West Sussex. It is easily accessed by car or train (or bus) from Brighton, London or Gatwick Airport. The design of The Lodge is light, sunny and spaciously open plan. The atmosphere is both relaxing and serene with secluded accommodation, decorated and furnished to a high standard using muted colours and French antiques together with modern luxury. The kitchen is very spacious and well appointed. There is a good size bathroom with a large walk in shower and heated towel rail. The bedroom area has a Super King bed with Eqyptian cotton bed linen, fluffy towels, cosy dressing robes. The kitchen is spaciously designed and fully equipped with ample worktops, a breakfast bar with stools under, a Fan assisted oven, electric hob, microwave oven, dishwasher, washing machine and a fridge with an icebox. There is a good size bathroom with a large walk in shower and heated towel rail. Good size bathroom mirrored cabinet and storage rack. Large cotton towels, and hand towels. Soap and toilet paper are provided. Window. In the sitting room area, there are two small comfortable fireside chairs. The TV has a DVD player. There is internet connection, and a clock radio with an iPod charger and dock to play your own music. ample dishes cups mugs glasses cutlery and cooking utensils, saucepans and frying pan. Roasting tin and casserole dish. Serving dishes Tea towels dish clothes, napkins. Kitchen foil and cling film. Small secluded terrace with table and chairs. There are tennis courts available on the village recreation ground, less than 5 minute walk from The Lodge. There are two 18 hole golf courses within 3 miles and two 9 hole courses and a driving range within 5 miles. Notes on accommodation: Through double French doors there is a small private sunny terrace with a table and chairs for eating outside or just sitting enjoying your space. Access to The Lodge is gained through a personal gateway, leading onto the terrace. Or you may wish to take the picnic chairs onto the Village Green, just opposite, and relax there with your favourite book. The Lodge is somewhat tucked away, yet in the heart of a pretty quiet West Sussex village, with excellent restaurants and a 15th century public house selling locally brewed beers and excellent local wines and champagnes. There are also in the village a wealth of boutique shops. To take advantage of the self catering facilities, we also have a well stocked delicatessen, selling artisan breads, local cheeses and other delicacies, a fresh fish shop offering local caught fish and advice with cooking skills, a private wine merchant, a well stocked green grocer and a family run butcher, should you wish to buy food and cook back at The Lodge. Outside: Through double French doors there is a small private sunny and secluded terrace with a table and chairs for eating outside or just sitting enjoying your space. Cleaning / Towels / Linen / Maid service: Towels and linen are included. Beautiful lodge, spacious, clean, all the amenities you need, full kitchen, great location, owners very welcoming and friendly, great find. Lovely lodge perfect for a couple. Huge comfortable bed and we'll equipped kitchen. Had air con which was amazing. Slept better here than I do at home😁� Owners Rod and Gerry very helpful but unobtrusive. Close to beautiful countryside and 20 mins from Brighton. The village of Hurstpierpoint is well served with pubs shops and restaurants. Nice place. Thank you for such a lovely review. You were what we call 'perfect guests' those who enjoy all that the surrounding area has to offer. It was a pleasure to meet you and I am so pleased that you had such a lovely break. We look forward to hosting you again sometime. Lovely property with everything you need & great location! The property was lovely, bigger than it seems in the pictures & had everything that you could need. The location is great with several good places to eat & drink within easy walking distance & others within a short drive. Excellent location for lots of walks & good information pack in the property about the area. We had a really lovely & relaxing break. Thank you! Thanks to our lovely guests, who enjoyed our Lodge and all the surroundings. Sussex has a lot to offer, and it’s always good when we are visited by lovely people who make the most of what is around. We look forward to seeing you again. The Lodge is very cosy, but everything you need has been incorporated, we even had a gift box of gluten free chocolate biscuits which I really enjoyed! The velux roof light has its own roller blind so the lodge can be made totally dark at night. Comfy garden chairs were provided so we had breakfast in the little courtyard garden on a couple of sunny mornings. We used the DVD to watch one of the selection provided but only tried to watch the television once and somehow didn't manage to follow the instructions but that didn't matter as we didn't particularly need to watch. The washing machine did a great job and is very cunningly hidden away under the breakfast counter. We didn't need to use the dishwasher but everything was provided for using it if we had wanted to. For some reason we couldn't identify the switch to turn on the heated towel rail but in mid summer we were able to dry the big fluffy towels provided on the drying rack cleverly tucked away beside the wardrobe( inside which were an ironing board and iron). The village is charming, I found a bakery selling gluten free bread there too - a real bonus in a tiny village. 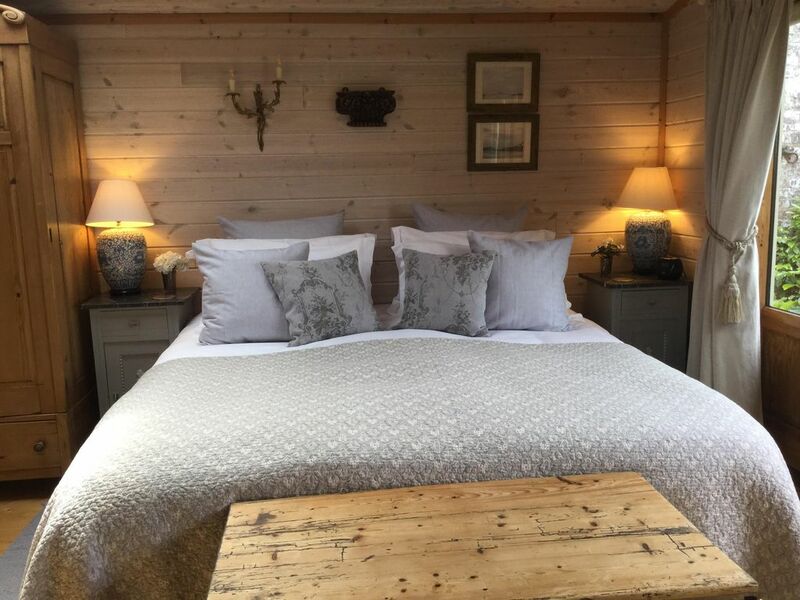 We definitely recommend this charming retreat near a Brighton for a relaxing two person break, and we're delighted to be so kindly welcomed by the owners who gave excellent directions to enable us to find the Lodge. Very nice, clean and comfortable! Nicely welcomed by our hosts! Greeted by owner who was very pleasant and chatty. The accommodation was like a very large, beautifully fitted out hotel room with attached kitchen and shower room (although I would have liked a bath). Everything you need in holiday accommodation was provided. The bed was enormous and the white linen was spotless. Although it was very close to the busy High Street it was peaceful, and the patio area was charming. A couple of minor problems. The radiator/towel rail leaked oil on the bathroom floor when turned on. We put a pot under the leak and told the owner first thing the next day, expecting it to be fixed when we returned in the evening. It was not fixed then, or at all. The pot remained and we were reluctant to turn the radiator on to dry our towels. On our last night there was a heavy rain storm. The velux skylight started to let water in, which dripped on the side of the bed. We pushed the bed as far as possible out of the way, and eventually the rain stopped. So did the drip. Given the above, and the lack of a bath, I feel the cost was rather excessive. Thank you for the positive aspect of your review. Regarding the problems with the radiator, we did explain to the quest that we had ordered and fitted a new element. However we hadn't tightened the fitted enough therefore creating a "very small "leak, which dripped into a very small pot. Sadly we didn't realise that was the problem and so reordered another element which hadn't been delivered in the time the quest was staying. We did apologies for this inconvenient, and thought that as the weather was warm the towels could be dryed by using the supplied airier. As for the skylight that was supposed to be leaking in the rain storm, it was in fact left open on the first catch. Had it have been closed at the time it would not have dripped on the bed. As for the lack of bath, we dont offer or advertise such a facility only a large walk in shower. We are sorry this quest wasn't completely safisified but all in all it was perhaps only the towel rail that was faulty. These things happen in the lifetime of a holiday rental, but we pride ourselves in providing a well kept and well maintained property. We hope all future guest will enjoy the continuing high standards that we pride ourselves in providing. However we are always here to help when things dont go to plan. The Lodge is 8 miles from Brighton and the coast. The Lodge is 16 miles from Gatwick airport, 2 miles from Hassocks station (on the London-to-Brighton line) and 3 miles from the A23/M23. It is about 21 miles from New haven and the Channel Ferry. 50 yards from Hurstpierpoint centre, 2 miles from Hassocks and 8 miles from Brighton. Ideal location for walking and riding on the South Downs. Booking Notes: Please contact owner. Changeover Day: Please contact owner. Notes on prices: Accepts Payment through PAYPAL. The prices are from £80 per night and vary depending on time of year.